The Book Rat: Lady Susan Read Along: Discussion Questions! Of hats, spencers, and chemises. Also, of Lady Susan, that delightful little whack job. For those of you who've been reading along with this year's group read, Lady Susan (or have read it in the past and are ready. to. talk! ), the time has come to break down this short epistolary work of Austen's! If you haven't read it yet, there's still time! It's very short and very quick, and you can pick up a copy for free from lots of places -- more about all that here. But now, let's get into it, shall we? What were your first / general impressions of Lady Susan. It's very different from Austen's other works, and not only because of it's epistolary nature. Were you surprised by it? Would you recommend it? Talk a bit about the character of Lady Susan. Did you find yourself feeling any sympathy for her? Do you make justifications for her scandalous or manipulative behavior? What was your favorite thing about her? Least favorite? What do you think really motivates her? What do you make of the epistolary style for this story? Is this your first time reading a story composed entirely of letters? Did it add anything to the story that you don't think you would have gotten otherwise? And are there things you feel were missing, or that came across awkward, for having to be conveyed through letters? Do you think Austen was just having a bit of fun by writing an anti-hero character like Lady Susan, or do you think she was modeled after someone in Jane's life? Do you have a favorite letter, character or incident from Lady Susan? Is there anything you would change, or anything you'd like to see happen in an adaptation of Lady Susan? Any final thoughts I didn't touch on? Would you reread or recommend Lady Susan? Feel free to skip around to any questions that intrigue you, or talk about things I didn't touch on -- whatever suits! You can answer in the comments, in a blog post of your own (drop us a link! 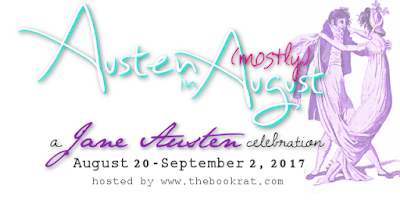 ), or on Twitter with the hashtag #AustenInAugust. I actually finished my audio listen on Saturday while I was gardening. So, my first impressions. This was a re-read for me, but I do remember my first encounter with Lady Susan. I was startled by her because she was unlike Austen's other novels. I enjoy epistolary format once in a while, but it does have its limitations, too. I would have loved to have gotten inside the head of a few of the characters more. Lady Susan as a person is actually appealing to me. I think she is deliciously selfish. Her situation as a widow under reduced circumstances would be pitiable if she weren't so resilient and strong in her own way. Plus, she acts against other people always to suit herself and sometimes out of spite. I am in the camp of folks who thinks Austen has a 'Lady Susan' in her general circle of acquaintance. I've been told one of her own older relations was much like Lady Susan. I also see a bit of the later written Mary Crawford in her though Mary is no where near the extreme of Susan. Lady Susan is pretty complex because at the start you want to sympathize with her but she shows her true colors and also uses her daughter for her benefits.